While your shiny new BLVD crowler may look like a big can, please keep in mind that you’ve just taken home 32 ounces of super fresh, crazy delicious draft beer. As such, please keep your crowler cold until it’s time to share it with deserving people (today, perhaps?) Upon opening, be sure to consume the beer in one sitting. Our crowlers are filled by skilled Boulevardians using the best technology and processes available, but their shelf lives are fleeting. To experience beer that is an accurate representation of our brewing intentions, please enjoy your crowler by the best-by date written on the label. A crowler is essentially an oversized (in our case, 32oz) aluminum can that’s filled from our draft system at (or just before) the time of purchase. Well, it looks like a can, but since it’s not filled on our fancy, state-of-the-art canning line, we hesitate to say it’s just like a can because it has a much shorter shelf life than cans or bottles filled on our packaging lines. Yep. Pretty cool, right? In addition to looking like a can, it does something that glass containers can’t do: it blocks out 100% of the evil UV light that derives pleasure from degrading hop compounds and skunking your delicious beer. Nope. It’s still not a can. It’s a perfectly clean aluminum vessel that, in contrast to a glass growler, keeps UV light out and does a better job of retaining precious CO2 because it’s seamed and sealed like a can. Can we please move on? Which BLVD beers can I get in a crowler? 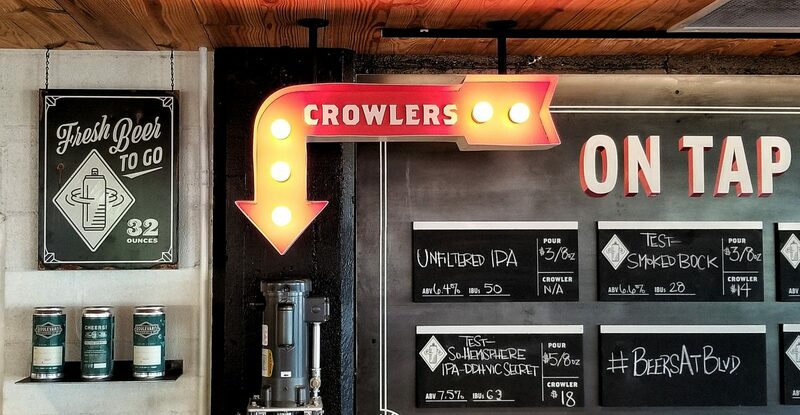 We offer crowlers of certain beers that are not sold commercially, such as test beers or (in some cases) one-off batches that were previously available only for on-site consumption in our Beer Hall or Tasting Room. Can I drink my crowler in the Beer Hall, Tasting Room, gift shop, restroom or parking lot? Please don’t. Our crowlers are strictly “to go,” allowing you to take away fresh, delicious Boulevard beer to share later with good friends or good-looking strangers. Other questions? Hit us up at beerhall@boulevard.com or find us on Facebook, Twitter and Instagram at @BLVDToursAndRec.